If we sit patiently with Job to read his story, we are rewarded . . . just as Job is rewarded for sitting with the Lord through suffering. If we take in the ideas Job exchanged with his friends, we are healed . . . just as Job is healed when he remains in God. If we live in fidelity to God as Job does, we experience humility . . . just as Job does when he hears the Lord speak. Honesty, authenticity, perseverance, courage, fidelity. These are the signposts we might follow as we move through life. They are antecedents of the meekness and fulfilment we see in Christ nearly a thousand years later. They are the presence of the consolation and healing we encounter in the Holy Spirit we experience in our own lives. They are the wisdom and peace we seek today. There is a value in reading scripture slowly while allowing time for reflection and meditation for in this way small themes are given time to blossom into guidelines for living. Today we find a significant idea hidden in the story of the defeat of Midian and it is this. God knows us so well that God forestalls human pride by asking us to rely on only God. In today’s story God asks Gideon to whittle his troops from thirty-two thousand to three hundred. And Gideon does this without questioning; he knows how reliable his God is. The culling process here is an unusual method for an army. On God’s instruction, Gideon first reminds his troops of the dangers of battle; later he watches how they drink water from the river. He does not appear to question God’s wisdom and he shows no anxiety; he knows how reliable his God is. Once the three hundred come together, Gideon gives them no more instruction than this: Watch me and follow my lead. After the winnowing process, these loyal soldiers follow Gideon just as he follows the Lord; they know how reliable their God is. Lying in wait outside the camp, Gideon and the third of the men who are with him overhear the telling of a dream by one of the Midian soldiers. The ominous conclusion is that although the Midianites, Amalekites and Kedemites are numerous as locusts, and although their camels number more than the grains of sand in the desert, the Israelites will be victorious. The Israelites show no angst about having reduced their number to three hundred; they know how reliable their God is . . . and the enemy flees. The Lord pronounces to Gideon: You have too many with you for me to pronounce you successful lest you vaunt yourself against me and believe that your own power brought you victory. This is the theme we see repeated often in Judges. The people cry out for help, Yahweh hears their cry and rescues them, once the people feel comfortable in their own skill and power they turn back to the pagan Baals . . . and the cycle repeats again. In Gideon’s story, we see the faith-filled soldiers put their trust in this God who has saved them countless times because . . . they know how reliable their God is. So often I have sat in meetings and watched someone defend their right to make unilateral decisions, forgetting that all comes from God, even the gift of leadership. I have watched these leaders struggle to bring others together behind their decisions not understanding that people follow best when decisions come from God rather than from human ego. They have forgotten – or perhaps have never known – how reliable their God is. We can rebel against these leaders or we can witness our own confidence in God to them. The choice is always ours. Rather than react in fear, we can act in reliance – just as Gideon does in today’s story, and just as his soldiers do – we can demonstrate to others through our lack of arrogance just how reliable is our God. And so we pray . . . Powerful and loving God, you know us so well that you understand our tendency to take credit for your gifts. You know that we are inclined to strut with pride when we are successful and complain in fear when we fail. You know that we often believe in ourselves more than we believe in you. Strip us of all hubris and arrogance; bring us humility and modesty. Wipe away our anxiety and fill us with your love. Remind us to follow your lead just as Gideon and his soldiers do. Remind us that when we rely on ourselves alone . . . we forsake the gift of your wisdom and authority that you so freely give to those who follow you. Tell us again what you have already shown us but that we have so quickly forgotten . . . that we need not fear anyone or anything . . . for we know how reliable our God is. Amen. We will be away from the Internet for several days. Please enjoy this reflection first posted on July 21, 2011. We may well want to consider how we react to the news that we are chosen loved ones. Do we step ahead quickly to shove our way forward in response to God’s call? Or do we tend to those along the margins who cannot find a way into the unifying force of God’s hope? Bear with one another . . .
Do we follow Christ in fits and starts? Or do we move constantly and slowly forward, always remaining faithful in reflection of God’s fidelity? If anyone has a complaint against another, forgive each other . . .
Do we greet one another with greed or compassion? Anger or mercy? Chaos or peace? Do we welcome the stranger, speak out against injustice, console the sorrowful, and heal the sick? Do we work for reconciliation? Do we open our eyes, ears, hearts, hands and minds? Do we act as if we are chosen in God’s humble love? When we use the scripture link and the drop-down menus, we find that being chosen is more than we have first thought. Jesus proposes that we set aside the accolades of life as we know it on earth; and this will be difficult to do because our desire for honor and fame, pleasure, power and wealth too often outweighs our willingness to surrender to God’s plan, to forego the hunger for control and celebrity. Today we remember a message from Paul that we have contemplated a number of times during our Noontime journey. We might wonder how we are to invert our lives. We might question how we are to give up all the world offers to take on the qualities of steadfastness, fidelity, meekness, willingness to mourn and to undergo hardship while we follow Christ Jesus on his Way. This picture of the world is the inversion of the one we usually hold dear. This view of the world is one we will want to explore. This view of the world shows us a leader who serves with humility and care. This picture of the world invites us to newness through service and love. When we compare varying versions of these verses, we better understand the call to live an inverted life. If we are to pay our taxes and tithes as Jesus tells us, if we are to allow Christ to transform the stones we want to throw into stepping stones that save us from drowning, we may want again review the rules for the road we journey with Christ. My friends, if someone is caught in any kind of wrongdoing, those of you who are spiritual should set him right; but you must do it in a gentle way . . . Keep an eye on yourselves, so that you will not be tempted, too. We listen to Jesus who brings us the fullness of the Law of Love. We live the meekness of Christ to guard against the lure of pride. If you think you are something when you really are nothing, you are only deceiving yourself. We remember that God is the ultimate and only judge of our hearts. We share the Good News humbly, gently and persistently. If you are being taught the Christian message, you should share all the good things you have with your teacher. We remember that God is in charge. Do not deceive yourselves; no one makes a fool of God. You will reap exactly what you plant. We believe that we reap what we sow. If you plant in the field of your natural desires, from it you will gather the harvest of death; if you plant in the field of the Spirit, from the Spirit you will gather the harvest of eternal life. We understand that we become weary from our determined striving through Christ. We honor our relationship with God by doing good for and to others. So then, as often as we have the chance, we should do good to everyone. We reflect today on these reminders of the Rules for the Road in our journey with Christ. This ancient hymn is replete with images of strength; God is mighty, subdues all, sets us at the head of the line! Who could not want to follow a God like this? There must be a catch, we say to ourselves. Perhaps there is. What is the real cost of following God who subjects all to one will? And are we ready to pay the full price? Are we willing to applause this one at any cost to ourselves? In the New Testament Jesus more fully explains the living God. Hypocrite! First get rid of the log in your own eye; then you will see well enough to deal with the speck in your friend’s eye. (Matthew 7:5) Is this a rebuke we can celebrate in ourselves? I’ll say it again–it is easier for a camel to go through the eye of a needle than for a rich person to enter the Kingdom of God!” (Matthew 19:24) Is this a thinking we can cheer? But I say, love your enemies! Pray for those who persecute you! (Matthew 5:44) Is this a command we can follow? The powerful, Old Testament Yahweh becomes the thoughtful, meek Jesus who speaks and heals with authority. When we say we want to follow God, what is our image? Whom do we obey? Which version of power do we choose to worship? And whom do we praise? When we compare varying translations of these verses, we being to understand their impact on our lives. We begin to see what it is we applaud . . . and why. We continue to look for God’s yardstick in New Scripture. 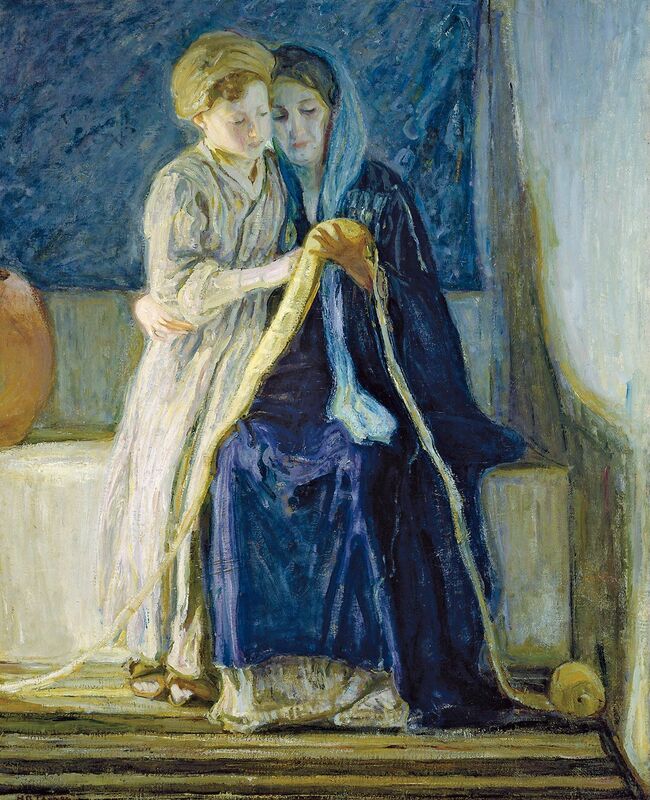 As we learn how to enter into God’s humility we also acquire self-knowledge, and it is this deeper understanding that leads us to the second beatitude, “Blessed are those who mourn, for they will be comforted.” This poverty of spirit shows us that sadness is not to be avoided for it is in the depths of grief that we encounter God most deeply. Through humility we arrive at understanding that our successes and failures come to us through no talent of our own . . . but through God’s deep, infinite and abiding goodness. When we refuse to understand this truth we find ourselves stalled on God’s ladder of beatitude. When we blame God for the disaster, sadness and darkness in the world, we demonstrate our own refusal to act with God to heal, bridge, console, and include. When we admit that we are not in charge, we are ready for the third rung on God’s Yardstick. “Blessed are the meek, for they will inherit the earth.” We often understand the quality of meekness as sweetness and affability rather than strength, but the meekness that Jesus displays is a willingness to be taught. Those who are meek as Jesus is meek have submitted their strength to God for God’s use. They have no arrogance and so they become instruments of God’s authority – both here on earth and later. So it is through our poverty of spirit and sadness that we arrive at possessing authority. It is through the power of Christ that the paradox unfolds . . . and we move to the fourth beatitude. Adapted from a favorite written on January 5, 2007.